Switzerland is a country tucked in between the Alps who has the reputation of being an eternally neutral nation. He has blonde hair cut in a bob just above his shoulders. 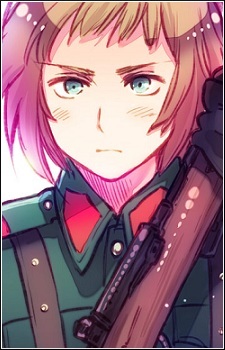 In earlier artwork, his eyes were colored blue, but in more recent artwork and in the anime adaptation, his eyes are colored green. When they were children, Switzerland was close to Austria. Switzerland spent most of his days bailing out and saving Austria, who often got beat up by Hungary. Despite their closeness, bitter feelings arose between them and caused them to split because their boss couldn’t distinguish between the two countries. In present day, the two cannot stand to look at each other, and Switzerland tries to deny that they were ever friends. After WWI, Switzerland saved his neighboring country, Liechtenstein, from starvation. It was later found out that at the time, he himself didn’t have enough to eat, and did not ask to be repaid in any way, saying that it was his duty to help out a neighboring country. Since then, Liechtenstein has been like a sister to him and lives in his house. She’s really the only one that Switzerland is nice to and shows compassion towards. He is very protective of her and often times finds himself doting on her. He has been described as being strong and united, but xenophobic, frugal, and somewhat of a hermit. Most consider him as being peaceful, but are deathly afraid of fighting him because he is known for having the strongest army in the world, is one of the biggest producers of guns and other weapons, and has the world’s wallet in the palm of his hand. Switzerland is also known for being an extremely hard worker, going so far as to not stop a job until the very end when it is completely finished. He has a short temper, but can be gentle and kind when around Liechtenstein. The Vatican once hired him as a mercenary, and it was shown that he has three pet goats named Eiger, Jungfrau, and Mönch (Switzerland’s famous mountains). Switzerland has also been shown to become somewhat trigger-happy when Italy, who has the bad habit of forgetting to put on pants, runs pant-less across his border and throughout his property. Also to note is that the katakana for Switzerland’s name is「バッシュ」 (literally “Basshu”). His first name has been romanized as “Vash” by some fans, but a more accurate spelling would be “Basch,” considering that a German “v” sounds like an “f” in English, which would not match up with the original katakana.